Editors Note-In honor of tonight’s National Championship game I would like to share a piece I did for my sportswriting class. The assignment was to write a feature on a Hofstra athlete. Enjoy! 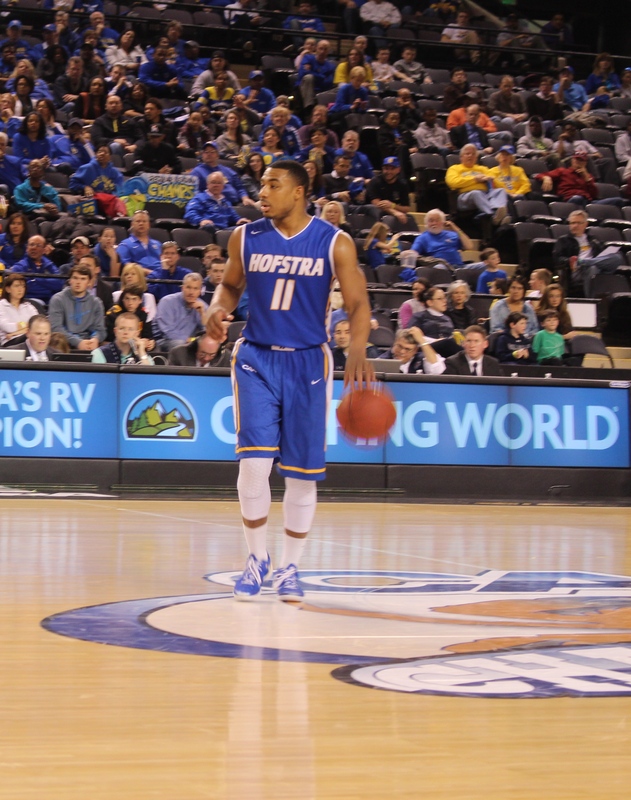 The college career of Hofstra senior, Dion Nesmith, has been a long, but rewarding journey. Nesmith’s college athletics career spans three universities and two different sports. The loss of one sport rekindled the love of another for the graduate student. Nesmith began his college career in 2009 at Northeastern University as a redshirt freshman on the football team. He accepted a scholarship with the Huskies after being a standout on the football and basketball team at his hometown high school in Union, New Jersey. Nesmith also played baseball during his freshmen year of high school, but eventually focused on just two sports. When contemplating where he would attend college, he was faced with a tough decision. “Looking forward, Northeastern was probably the best academic school to offer me a scholarship so I took it and ran with it,” says Nesmith. On November 22, 2009, just one day after the Huskies won their final game of the season, the University announced that it was dropping the football program after 74 years because it was too expensive to maintain. Faced with uncertainty about his athletics career, Nesmith had another tough decision to make. “The months leading after it were tough because I didn’t know what I wanted to do, if I wanted to keep playing football or play basketball or just go to school,” says Nesmith. “It’s tough you know, you’re eighteen years old and you have to make a decision for the rest of your life.” He was recruited by multiple schools for football and even took a visit to Central Connecticut State. In the end, he went back to his first love and accepted a basketball scholarship at Monmouth University. Nesmith sat out his first season at Monmouth due to NCAA transfer rules. In two seasons with the Hawks, he averaged 13.3 points per game and started 88 of 93 games. He graduated from Monmouth in the spring of 2013 with a degree in finance, but he still had two years of eligibility as a graduate athlete remaining. Nesmith decided to transfer once again and finish his athletic career on the Hofstra University basketball team “I thought it was better for me to go someplace else and maybe expand my game a little bit and Hofstra was the right place for that,” says Nesmith. Looking back on the many changes that have occurred during his college career, Nesmith says that he has no regrets about how things played out. “I wouldn’t be in the place I am now and the position I am to do things going forward in my life if those events didn’t happen and I’m not upset with any of them,” says Nesmith. Now that his college playing days have come to an end, Nesmith has begun to look towards the future. He will graduate from Hofstra in May with a MBA degree with a concentration in business analytics. “Right now I am trying to pick an agent so I can go overseas to play basketball, but I am also weighing my options back home maybe getting a job with my MBA,” says Nesmith. After a long, but successful journey in the world of college sports, it is safe to say that Nesmith will excel in whatever path he chooses.